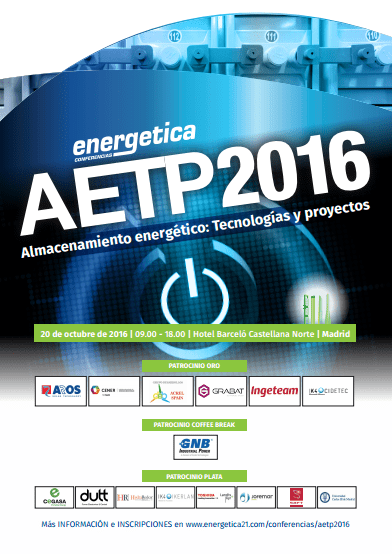 The technical conference AETP2016 “Energy storage, technologies and projects”, held on 20th of October 20 in Madrid, analyzed the current landscape of energy storage, where technologies such as Vanadium Redox batteries are making a breakthrough. The market increasingly demands tailored solutions for each project. HYDRAREDOX IBERIA, S.L. (HRI), a company that has a unique energy storage system based on a radically new concept of Vanadium Redox technology, participated as a sponsor with the presentation. “The Real Value of Electric Storage”. Any comparison and evaluation of electrical storage technologies must go beyond considering only the specific manufacturing costs but also include the operation and maintenance costs and the dismantling costs of the installation at the end of its useful life. HydraRedox’s presentation highlighted showing the importance of cost control as well as the importance of flexibility of design to generate income. In this context, the Spanish manufacturer’s vanadium redox battery is in a strong position from a technical and economic perspective.